gasp! how lovely, evocative, delicate………thank you for that image. Wonderful texture. 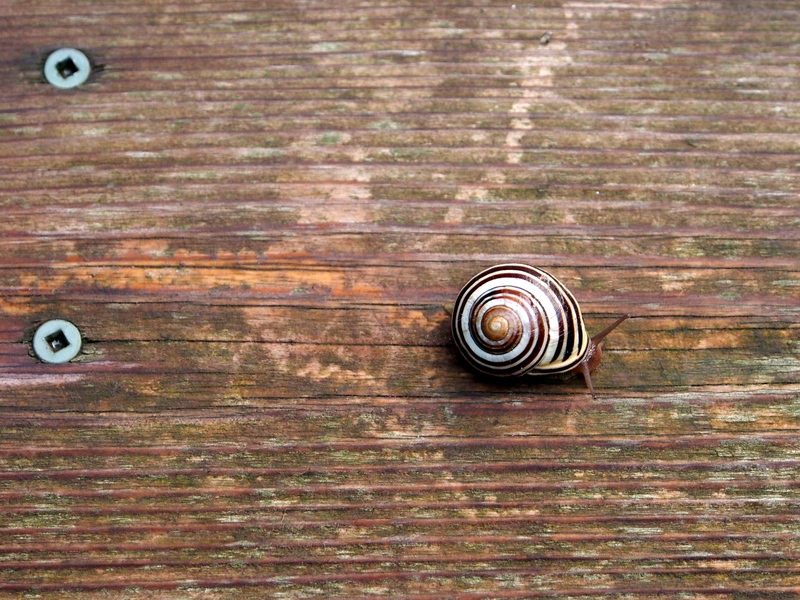 Also, I love how you’ll contrasted the horizontal lines in the wood grain with the snail’s circular shell. Then the circles are repeated by the wood screws. Very nice composition. Thanks so much, Allen! I was literally heading out the door, when I saw this wonderful creature on the step and had to stop to take the image. Thanks so much for your lovely comment! So beautiful and quiet Juli. The image of this wee little creature made me pause, and enjoy my day just a bit more. Thanks. Thank you for your beautiful message. Simply, thank you, so much! I agree with Allen – love the contrast in circular versus horizontal line; the repeated color palette and circle shapes in the screws and snail shell. Lovely surprise! It was, indeed, a lovely surprise! I stopped to take a few photos, and by the time I had returned an hour later, this little bit of wonder had wandered on. Beneath the lilac bush, I suspect. So, it was divine timing…or I would have missed this wee bit of joy! Love the exquisite simplicity and surprisingly imbalanced balanced composition. Great find!!! And what a beautiful little wonder this is. I hope you’ve had a fantastic day! xo. A little wonder, indeed! What an exquisite little creature – the prettiest snail I’ve ever seen. I’m so glad you paused to capture and share its portrait with us.